I was expecting just a little more color from Guerlain's Météorites Perles du Dragon ($58) from the Liu Holiday 2012 Collection. The promotional photo is above. My photo directly below shows what Preles du Dragon looks like to my camera and my eyes. If it weren't for the packaging, shown below, I would swear I got the wrong item. I'm not really complaining, I love my new Météorites. They just aren't what I expected. I rearranged the little balls a bit, exposing the lavender ones more, but I didn't see a remarkable difference. I wonder how Guerlain ensures that the color balance is right when the Météorites are manufactured. That said, there has never been a Guerlain Météorites that wasn't a divine finishing powder, and this new version maintains that reputation. Météorites Perles du Dragon is named for this Year of the Dragon and pays tribute to this mythical animal - a symbol of the emperor of China, whose primary source of power lay in a pearl that was synonymous with happiness, wisdom, and abundance. The harmony of six shades of pearls in an intense, iridescent monochrome palette is perfectly tailored to the holiday season. Like nighttime jewels, it cloaks the face in incredible radiance: pale pink and beige even out the complexion, white and gold illuminate, while plum and rosewood brighten areas of shadow and erase fatigue as the night goes on. Its famous metal case, also embossed in black, is stamped with a golden rosette on its lid and bears the Guerlain signature. Bloggers with pale skin who try to photograph and show finishing powders are either eternal optimists or crazy. I may fall into the crazy lot, but I really wanted to show you the beautiful finish Perles du Dragon adds to the skin. I took my photos in full sun, hoping to get enough light to show the gorgeous pastel enhancement to my skin. You can see it, right? I applied the Météorites to the center of my arm with a blush brush. Look at the finish! It's pale and smoothes the imperfections in my skin. 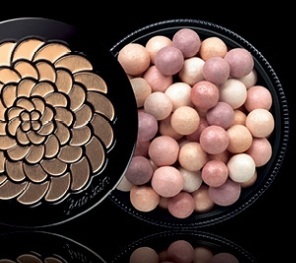 That's the beauty of Guerlain's Météorites. They add a finish to your face that's flattering, smoothing the texture and color, while adding a subtle radiance. Perles du Dragon is softly shimmering. The powder leaves an illuminated finish. The sunshine added a little extra shimmer to my skin, but the photos are relatively accurate. If you have any doubts, you must try this beautiful new addition to Guerlain's Météorites collection - if you want perfect skin, like the model below. I purchased my new Perles du Dragon at Neiman Marcus. It appears that all of the Guerlain counters have received the new Liu Holiday Color Collection. Those perles look more white in your container. In the promo there was more pink. Do you think CG, this was a deliberate bait and switch? I'm going to pass on these, I still have the Pucci meteorites from this summer and no matter what color you see on the meteorite balls, you always get that amazing subtle airbrushed look. Are you springing for the Liu shimmer powder atomizer? I still have the LE Vol de Nuit Shimmer Powder last Christmas and am hoarding it, extremely wonderful!! Like Charlestongirl, I was surprised--pleasantly surprised--when I saw these at the counter. Based on the promo, I was expecting something darker and similar to the Perles d'Or from two years ago. Perles du Dragon are much lighter and have an illuminating effect that reminds me of fine Akoya pearls. They can easily be used as an all-over finishing powder by those of us with fair/light complexions and are gorgeous brushed on the décolletté. Medium complexions can use these to highlight areas of the face and body with pearlescence. They'd be gorgeous swept in the classic "C" and blended into a soft pink or rose blush on the cheek. I collect LE Météorites so I got out my Perles d'Or to compare the two. Verdict? They have a totally different appearance in the container and on the skin (I'm fair). On my skin, Perles d'Or reminds me of candlelight whereas Perles du Dragon is all about the finest pearls. Of course you didn't ask me, but I sincerely doubt that Guerlain pulled a bait and switch. Guerlain has such a strong and loyal customer base that they really don't need to resort to that kind of deceptive marketing. I think it was just one of those things that occasionally happens in the world of photography. If your complexion is on the lighter side, you might want to check the new Météorites out. They give a look that is significantly different front the Pucci version. Whereas Pucci was the sun, Dragon is the moon :-) But no matter the tint, they all give that amazing soft-focus glow. What a finish, indeed! Really beautiful, really elegant. Thank you for sharing this info, C-girl! Hi Anonymous, I would not say it's a bait and switch. I did buy Liu, and it is VERY sparkly. I have swatch photos and will post. At worst, the color differences are a quality control issue. At best? Our photo lighting was completely different. Guerlain has no incentive to pull a switcheroo. Oh I am looking forward to these and they come out this week! (UK) I have to say that this swatch of the Meteorites (any Meteorites) is the best I have ever seen! The effect is so difficult to capture on camera, but I think you've just about done it. This was originally the only item from the winter collection that I wanted, but I've added Lou-Ling lipstick thanks to your beautiful swatch! That will be all though, since Guerlain is only an occasional splurge for me. I enjoy these more when I keep my collections restrained somewhat. Of on an tangent, but Eileen, why don't you write a blog? As well as the blog posts I read, I also look forward to the comments you leave (no matter the blog, I know it's you, your writing is unmistakable!) The way you talk about makeup is like no one else, it's not simply about the product and it's merits (or lack thereof). I think it's the way you describe what the product does for one's looks, the way it might bring beauty to a feature in a certain way, but you don't do it in a technical make-up artist way; it's quite different. In fact, the way you describe things, you can apply it to anybody, I can't quite describe it, it's almost poetic. Also, it's interesting to see someone's insights on the current trends and makeup from one who has seen them first time around; that's one of the many reasons I like this blog and there aren't enough of you around the internet in my opinion. I like reading all ages, even if many of the products aren't relevant to me, because of all the different perspectives people have. If you ever start, I will definitely be one of your first readers! It doesn't have to be a daily blog either. Hey there, Leila. I offered Eileen a spot writing for Best Things in Beauty, but she said she prefers to write comments - here and on other sites. She knows she has a standing invitation. :) It's a great idea! All other reviews that I have read so far have all noted that there were far more white perles than expected compared to the promo pictures and even the displays in store. However I'm glad the finish is still wonderful. Love the description using akoya pearls too btw! I must look at some of the reviews. I never have much time to read others' blogs. Sigh! Thanks for your fabulous introductions to the best in beauty. Based on your reviews, I bought Guerlain Turandot palette and the Perles du Dragon. All the colors in Turnadot work for me. They look browner on my skin than in the palette and remind me of the glorious warm colors that were so prevalent in the 70s. The quality is outstanding. I got to know the SA in Nordstrom/Pentagon City, Sara, who has exquisite taste and can put together a look for you in two seconds flat. As can Nancy, the SA at Armani. These are purchases I wouldn't normally make but after reading you blog (and learning what "griege" is!) I have a beautiful selection of some very high-quality stuff! With lid on, I tip my Météorites upside down and shake very gently and then remove the lid. I use the powder that has accumulated on the lid as my finishing powder. I always get a nice mix of color that way. I hope your mom is doing well. You reminded me that I have to get my flu shot. I best do that this week. I bet Perles du Dragon are positively stunning on your porcelain complexion. Turandot might not have been made for you, but this year's Météorites sure were. Talk about radiant! Hi Xnyorkr! That's fabulous! I seldom go to that store, but I must look them up. Have fun with your new colors! You're right, Eileen. They are perfect for me. Mom got her flu shot. I never get them. They hurt my arm (badly), so I rely on those around me to get their shots. :) I wouldn't recommend it, but it works for me. Thank you Eileen!!!!! I really appreciate your taking the time, and I guess now I can happily go get my Meteorites without feeling bad about it ;). Thank you so much again! I can't wait for my Meteorites to come and my polish. I'm debating buying the Lou Ling lipstick and actually I still haven't bought the Liu palette. The lip colors do work for me but the shadows, I'm not quite sure if they favor me but I need to decide before it's gone! The Meteorites look wonderful. Do you think that they would have any effect on redness, either exacerbating or minimizing? Anonymous, they minimize redness for me. Thanks for your input! I am rather excited now. I spent over an hour last night researching the Meteorites and based on the reviews I've read, I've come to the conclusion that you're absolutely right: they are subtle but they add a noticeable glow. I can't wait to get it! Click on any photos here to enlarge them. I'd love to hear from you! Unfortunately, I no longer have time to provide personal color or skin care recommendations. As chosen by Theperformanceleader.com readers!